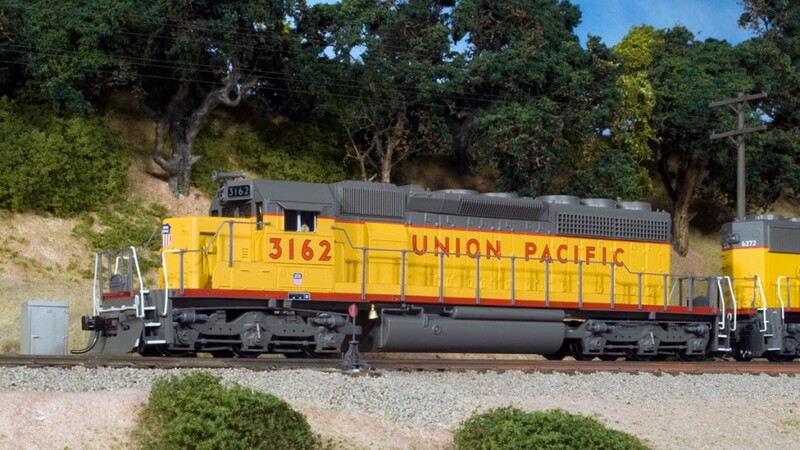 The BlueLine locomotives are really targeted at modelers using DC power who want sound, but they have an 8-pin DCC plug and can be equipped with decoder. I cover how to do that on the DVD. Only common CVs or those that were changed from their default values are listed. Since I chose not to keep this locomotive, I left most of the settings at their defaults. 17 (extended address) 204 For locomotives with a 4-digit address, CV 17 and 18 together determine the address. To be honest I never try to set these manually. My Digitrax system does all this automatically for me when I program a 4-digit address. I have to confess that I am not terribly impressed with this locomotive. The detail is crude compared to modern Athearn or Kato SD40-2s, it doesn’t run as well, and the sound system is not as good as some others. Having to use a separate decoder for motor control makes programming difficult. 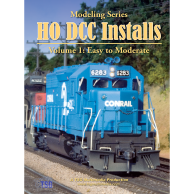 BlueLine locomotives are a little cheaper than their QSI-equipped counterparts from BLI, but when you add in the cost of a motor decoder, plus the hassle of installation and programming, you really aren’t saving anything. I really did not like the factory electronics in this locomotive. Even on DC, the locomotive was awkward to run. Like any sound-equipped unit on DC, it takes quite a bit of throttle just to get it going. Beyond that, though, it seemed to respond to throttle commands when it felt like it. I advanced my DC throttle and the locomotive just sat there. Eventually it would move. Stopping was just as difficult to control. The Digitrax DH163-series decoders are overall pretty good, and the locomotive ran better and more predictably on DCC. Unfortunately, after I’d installed the decoder and ran it for a few days and everything seemed fine, the decoder spontaneously fried. I’ve never had a Digitrax decoder do that before, so I suspect the BlueLine electronics. Usually if a decoder fails it does it immediately because something wasn’t connected properly, but in this case it was a simple plug-in install, and I checked it carefully to make sure that all the pins were in the right holes.